SEPTEMBER IS Family Meals Month focused on discovering how one small change per week can improve your family’s health and happiness. We want to make sure that emerging brands know about National Family Meals Month and think about ways to partner with your retailers to celebrate in September ….or anytime it makes sense! 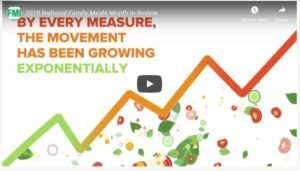 Take a look at the 3-min Family Meals Month overview video and then watch this about the partners that are making it sizzle! Here is a list of retailers who already have celebration programs underway. Families have the desire to prepare and share more meals at home, but they find it challenging to make it happen more often. They need to hear the facts about the benefits of family meals and the impact this behavior can have on their family and our nation as a whole. They need to know that today’s brands and grocers are evolving to bring them new ways to make meals at home easier and more affordable. You can help grocers turn data points into compelling shopper messaging and position your company and products as supporting families as they strive to enjoy more meals together. There’s clear evidence the structure of a meal can heavily influence a child’s long-term health. Kids and teens who share meals with their family three or more times per week are significantly less likely to be overweight, more likely to eat healthy foods and less likely to have eating disorders. Berge, J. (2015). The protective role of family meals for youth obesity: 10-year longitudinal associations. The Journal of Pediatrics, 166 (2). With each additional family meal shared each week, adolescents are less likely to show symptoms of depression, less likely to use/abuse drugs and less likely to engage in delinquent acts. Meier, A. and Musick, K. (2014). Variation in associations between family dinners and adolescent well-being. Journal of Marriage and Family, 76 (1). A recent study also shows that children who grow up sharing meals as a family are more likely to exhibit prosocial behavior as adults, such as sharing, fairness and respect. De Backer, C.J. (2014). “Our” food versus “my” food. Investigating the relation between childhood shared food practices and prosocial behavior in Belgium. Appetite, 84 (January 2015). Adolescents who participate in even one or two family meals per week are less likely to be overweight or obese in adulthood compared to adolescents who never participate in family meals. Neumark-Sztainer, D. (2010). Family meals and adolescents: what have we learned from project EAT (eating amount teens)? Public Health Nutrition, 13 (7). When people cook most of their meals at home, they consume fewer carbohydrates, less sugar and less fat than those who cook less or not at all. Wolfson, J. and Bleich, S. (2014). Is cooking at home associated with better diet quality or weight-loss intention? Public Health Nutrition, Published online 17 November 2014. People who eat most the most home-cooked meals eat healthier and consume about 130 fewer calories daily, on average, compared to people who cook less or not at all. Wolfson, J. and Bleich, S. (2014). Is cooking at home associated with better diet quality or weight-loss intention? Public Health Nutrition, Published online 17 November 2014. 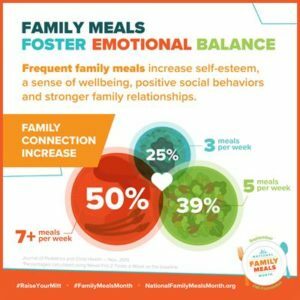 Children and adolescents who share family meals three or more times per week are more likely to be in a normal weight range and have healthier dietary and eating patterns than those who share fewer than three family meals together. Hammons, A. and Fiese, B. (2011). Is frequency of shared meals related to the nutritional health of children and adolescents? Pediatrics, 127 (6). Research concluded that educational and public health initiatives aimed at promoting shared family mealtimes may improve nutritional health of children and adolescents. Clinicians may advise their patients about the benefits of sharing three or more family mealtimes per week; benefits include a reduction in the odds for overweight (12%), eating unhealthy foods (20%), and disordered eating (35%) and an increase in the odds for eating healthy foods (24%). Hammons, A. and Fiese, B. (2011). Is frequency of shared meals related to the nutritional health of children and adolescents? Pediatrics, 127 (6). In a study examining the relationship between everyday family rituals and BMI measurements, boys who had a social dinner experience tended to have lower BMI, notably when the family stayed at the dinner table until everyone was finished eating. The results were the same for parents. Wansink, B. and Van Kleef, E. (2014). Dinner rituals that correlate with child and adult BMI. Obesity, 22 (5). 68% of consumers surveyed said that dinner is the mealtime most of the people in the household eat together. 70% of the survey population said they usually or always eat the same things when they eat together. The Hartman Group. Modern Eating: Cultural Roots, Daily Behaviors 2013. 81% percent of U.S. households cite home as the most popular location for eating dinner, and nearly half (50%) of consumers report eating dinner with everyone in their household every night of the week. Overall satisfaction was higher among those who made dinner at home compared to those who would eat out or have take-out food at home. The NPD Group. Dinnertime MealScape Study 2009. People are hungry for help in the kitchen. Shopper studies show that 81% of parents buy items with minimal prep time. Parents recognize and opt for convenience when time is limited. For many, convenience is as important as nutrition. The Food Marketing Institute. FMI Shopping for Health 2013. The Food Marketing Institute. FMI U.S. Grocery Shopper Trends 2014. In contrast to the relatively structured and uniform eating culture that the modern grocery store was first established to serve, today’s eating is more dynamic, democratized, and influenced by multiple family members having a voice in what is eaten and prepared (31% of Millennials report sharing at least half of the responsibility for dinner preparation). The Food Marketing Institute. FMI U.S. Grocery Shopper Trends 2014. More men are cooking: The number of male primary grocery shoppers is 43%. Male shoppers are keeping pace with their female counterparts in number of visits to stores and in visits across channels. Sharing shopping roles means that more shoppers are making more trips to more stores. The Food Marketing Institute. FMI Shopping for Health 2013. The Food Marketing Institute. FMI U.S. Grocery Shopper Trends 2014. Cooking is no longer a gender-based tradition. The percentage of men who spent time cooking on any given day has jumped to 42%, as compared to 29% in 1965. Smith, L. (2013). Trends in US home food preparation and consumption: analysis of national nutrition surveys and time use studies from 1965-1966 to 2007-2008. Nutrition Journal, 12 (45). 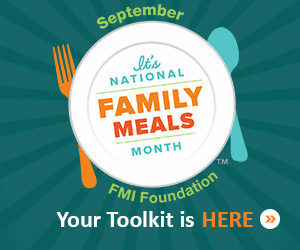 We invite you to join the movement and celebrate National Family Meals Month ™ in September. Here is the 101 on National Family Meals Month™ to share with your marketing and sales teams.